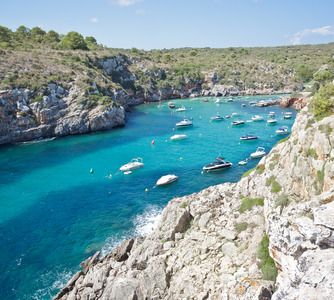 Es Canutell holidays take you to the south east coast of Menorca, just fifteen kilometres from the island's principle town Mahon. Holidays to Es Canutell can be taken from April until the end of October with temperatures rising from twenty to low thirties at the height of the season.It is a small resort centred round a sheltered cove with a sand and shingle beach. Holidays in Es Canutell are very popular with families and couples who are seeking relaxation by both day and night. It is not a party resort and evenings are as peaceful as the days with the larger hotels providing entertainment. We have a range of cheap Es Canutell holidays that may tempt those looking for a guarantee of summer sun in friendly surroundings. Our low cost Es Canutell holidays are excellent value as the standard of accommodation and service is never compromised. The Es Canutell all-inclusive holiday deals are worth considering, especially for families. Bars and restaurants serve a diverse cuisine which caters for most tastes. Shopping is rather limited but this matters little as there is a regular bus service to Mahon where shops and markets are plentiful. For further details and to discover our best Es Canutell holiday offers, please use the search facility.